At the outset, I am very delighted to express on my behalf and on behalf of the Kuwaiti delegation our deepest thanks and gratitude for all the warm welcome and generous hospitality since we have arrived to this great capital, Washington. And as well we thank the two delegations and the members of these delegations for all their efforts exerted in preparing for this distinguished meeting and all these distinguished efforts. We also would like in this context to reiterate our deepest, heartfelt condolences for all the destruction that happened in Texas because of Hurricane Harvey – all the losses of lives and all the destruction. We pray to God that the United States of America be spared the dangers of the looming Hurricane Irma, and that God protects your country and the American people, our friends, from any harm. 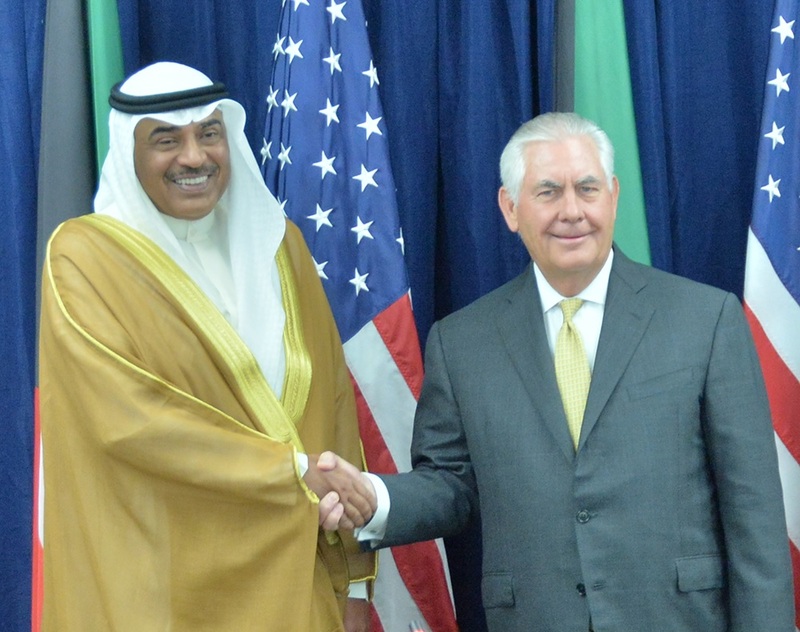 My dear friend, Secretary Tillerson, ladies and gentlemen, today as we meet, this comes to follow up on the historical and important meeting that happened between His Highness, the Emir of Kuwait, Sheikh Sabah al-Ahmad al-Jaber al-Sabah – God protect him – and His Excellency President Donald Trump to continue and follow up on all what they discussed, and try to implement it and execute it to shape the outlook, the future of the outlook of our relationship for the 25 year to come in a way that reflects the vision of our leadership and the aspiration of our people. 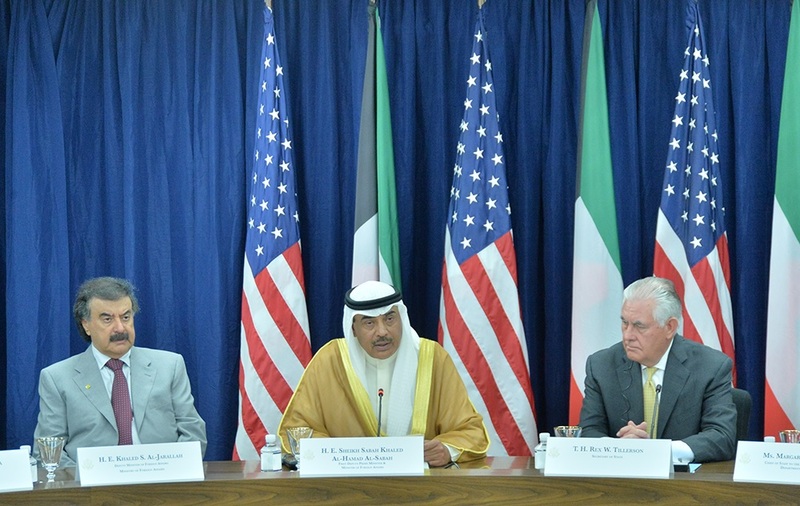 In this context we certainly much value what was said by President Trump when he met the Emir of Kuwait, His Royal Highness, Emir of Kuwait – God protects him – reaffirming the commitment of the United States of America to the security, the safety, and the stability of Kuwait. In culmination for the strong bonds between our two countries we send – we signed during the visit of the Emir of Kuwait, His Highness, to Washington during the second round of the strategic dialogue, we signed seven agreements and memorandum of understanding in the fields of counter terrorism, customs, petroleum, higher education, scientific research, investment, electricity and power, and water in addition to 16 agreements that were previously concluded, for a total of 23 agreements – total of agreements concluded between our two friendly countries. The size of the Kuwaiti representation in the second round of the strategic dialogue and the various representation of these various sectors present with us today that come from 10 various sectors and represent the various fields, vital fields of cooperation between our two countries – political, military, security, commerce, investments, education, cultural, and other fields of cooperation – this importance of Kuwait – to the importance of this dialogue. At the political level, I must underscore and praise the coordination and the continuous communication and interaction between our two friendly countries and the conversion of positions and visions in numerous issues and numerous dossier of mutual interests to the two countries. At the military level, Kuwait supports and provides facilities to the U.S. armed forces, the U.S. military that works within the global coalition to fight and combat the so-called Daesh, ISIS, the so called ISIS. And while we assert, as well, the importance of the defense agreement between our two countries that was concluded back in 1991. In this context, we certainly value and continuously praise the historical leadership role of your country in leading the international community and the global coalition to liberate Kuwait from the evil of the Iraqi aggression. And we certainly value the sacrifices of our soldiers and your soldiers, the brave soldiers, both Kuwaitis and the Americans, to restore legitimacy and to restore the right of the Kuwaiti people. And yesterday, at the security level as well, we signed the arrangement HSPD-6 to fight terrorism and share information in that context and also to have cooperation to address the security holes in Kuwait International Airport. We have reached an advanced level of cooperation, and we also continue to continue the implementation of the security arrangements in the passenger terminals at Kuwait International Airport and to also create an office for American Customs and American Border Security and also focusing on cyber security as one of the major topics of our cooperation in this next phase. At the economic and investment level, yesterday, Wednesday, we held – and there was an economic forum that was favorably and widely received with the participation of the deputy prime minister and minister of finance from our side and the commerce secretary from the U.S. side and presence and participation of a number of the participants from the Kuwaiti and American business communities to discuss the opportunities for mutual investment and to – also, we look forward to hosting this forum next year in Kuwait. Our volume of the investments – Kuwaiti investments in the U.S. has reached more than 400 billion U.S. dollars in various sectors. With regard to the volume of the commerce and trade between our two countries, until the mid of this year has reached 4 billion U.S. dollars. Kuwait further looks forward to implementing and increasing this volume in the future. At the level of the educational and cultural exchange, Kuwaitis in the United States have started to come to the U.S. universities since 1946. That is 70 years ago. Well, we have thousands of Kuwaiti citizens studying in the U.S. universities. And since our last round of this dialogue, we have increased the number of Kuwaitis coming to study in the U.S. In this context, we affirm our aspiration to increase the number of Kuwaiti students studying in U.S. colleges that has reached currently 15,000 female and male students. My friend Secretary Tillerson, ladies and gentleman, in conclusion I would like to reiterate my thanks and appreciation to you for all your efforts to make sure that the second round of this strategic dialogue be held on time, on schedule. I wish all the working groups that will meet in a few moments all the success, hoping that they will – the outcome would be concrete efforts, and the goal is to deepen the strategic bond between our two countries and to explore the various spaces to expand our cooperation over the next decades. Hoping to hold the third round of this strategic dialogue in Kuwait next year.